Grape vines are troublesome in some areas of the two State Natural Areas Kathie and I manage. They sprawl over everything and shade out the good plants. We spend quite a bit of time eradicating them. On the south-facing slope at Pleasant Valley Conservancy grapes are especially prevalent in the areas we call the "road cut", as the photo below shows. Grape vine infestation on the road cut, fall 2008. Because of their color, grapes are easy to find in the fall. 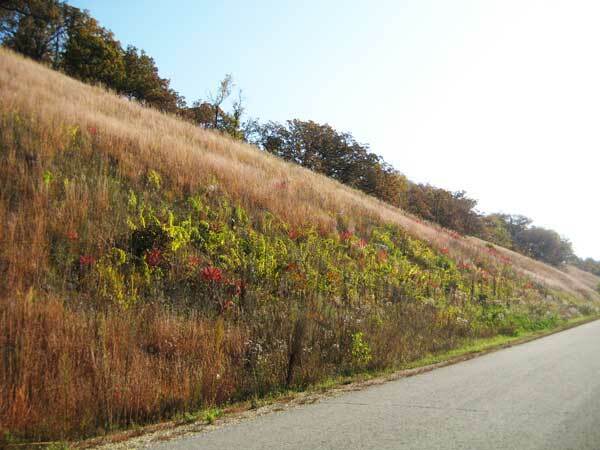 The road cut is actually a separate ecosystem from the rest of the south-facing slope. It is considerably steeper and hence gets much more intense sun (as the snow-melt patterns show). 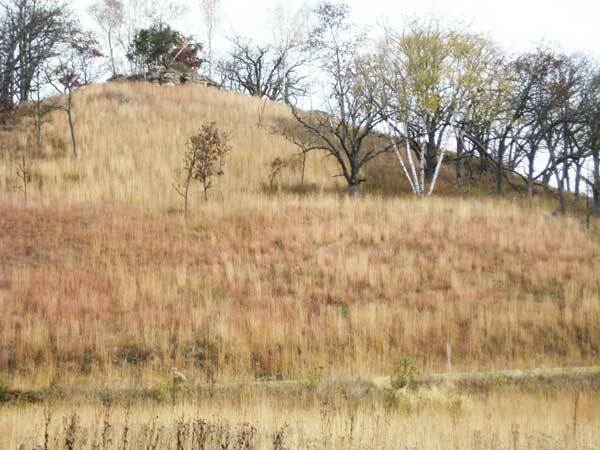 Hence it is much drier than the rest of the slope, making it difficult for the prairie grasses to compete. The only way to eradicate grape vines is with herbicide, and because of visibility fall is the good time. Three, four, or more long stems generally grow from a single root system, so if you can find that center you can get rid of the whole plant at once. It is best to grab a single stem and follow it back to its base, where the other stems should be visible. Basal treat each stem with 20% Garlon 4 in oil. The photo shows Kathie working on the road cut seen in the top photo. The most time consuming part of the task is finding the center. A quicker way to find the center is to wait until late fall or winter when the root system is easier to deal with, although because the leaves are gone, you can't find the plant as easily. Unfortunately, eradicating grape is a slow process, but well worth doing. The photo below shows the same south slope three years later. It is essentially grape-free. Same road cut essentially grape-free, 2011, three years after eradication. Yesterday we had ideal conditions for exploring the drainage system in our wetland. Our wetland contains a cold water stream plus a large number of springs. Some of the springs flow out only under the cattails or sedge meadows, whereas others have surface outflows. Our interest was in the surface ones since in the summer a lot of the springs with surface outflows are difficult to discern, being hidden by lush vegetation. Yesterday the conditions were perfect with bright sun and clear air. The temperature had dropped in the low teens during the night and at noon it was still a few degrees below freezing. 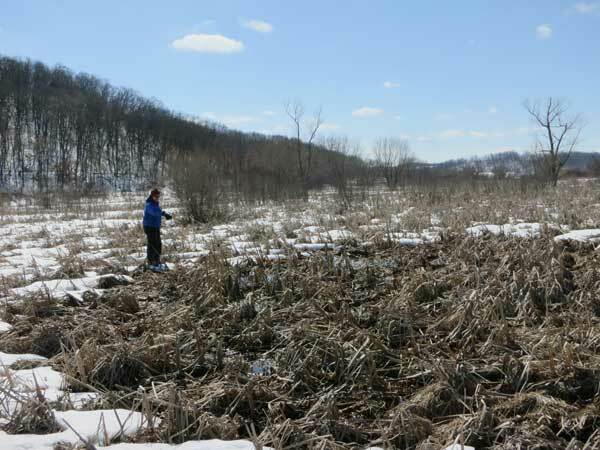 Most of the wetland was white with snow, but wherever there was spring water flowing the snow was melted and the springs were delineated by brown areas. Our wetland is riddled with potholes and springs, and because of the constant temperature of the groundwater (about 50 F), there are things flowing all year. The two dark bands in the photo below indicate two separate springs, the large one flowing west and the small one flowing east. The photo below shows Kathie standing on the edge of the large spring. The source was at least 4-5 feet deep. Although there is no obvious flow at the source, if you walk a few hundred feet downstream there is a substantial flow. The big pool here is choked with cattails. The air temperature was substantially below freezing and we walked across ice and frozen snow to reach this point. I examined a number of older air photos with GIS. Although a small creek of the sort we now have can be seen in all these photos, it is not always in the same place. In the 1990 air photo it was shorter but wider and the source seemed to be in a different place. It doesn't seem surprising that these little creeks should move around, because they don't have enough flow to carve substantial banks. No creek is visible at all in the 1937 air photo, which isn't surprising, since in those days the whole wetland had been tiled. On the other hand, the main water source, Pleasant Valley Creek, which flows enough to cut a substantial bank, has not changed its course a bit since 1937. Sandhills cranes have been back for some days now and we were able to get fairly close to one pair. 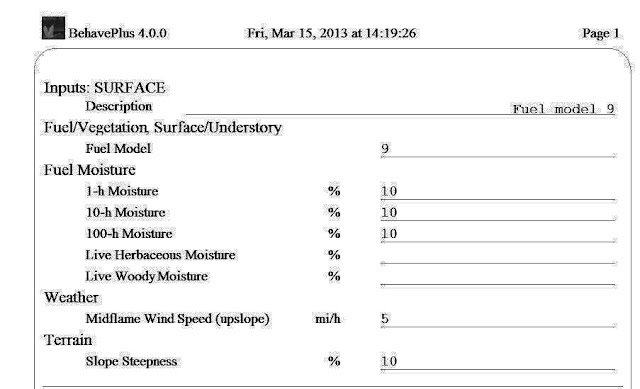 The screen shot below shows how the data are input to the model. Although I only used single input parameters, you generally will want to input a range of values. If you do, then the output is a table giving the calculations for your range of values, as well as a graph of the same output data. When people started burning oak woods one gap was what fuel model to use. Fortunately, Patrick Brose and associates at the USDA Forest Service Northeastern Research Station in Irvine, PA carried out field research to determine the appropriate model. The data showed that oak leaves burned hotter than other kinds of hardwood litter, but lots cooler than grasses. Brose determined that fuel model 9 worked best in the Behave program. The table below shows my results for a typical oak savanna burn and a comparison with two other fuel models that we often carry out. Most of the U.S.F.S. theoretical work related to prescribed fire has been done in the west but they are slowly recognizing that things are different in the east. Obviously, fire in an eastern oak forest is quite different from that in a lodgepole pine forest. The fuel model (9 for oak litter) was determined by research in hardwood forests in Virginia. The researchers found that oak leaf litter behaves differently than that of other northern hardwoods. According to the researchers: "...oak leaves weigh more than other northern hardwood litter and burn at a hotter temperature. Also, oak leaves form a porous fuel bed and are slow to decompose, even after being buried in snow for several months." The measured temperature for oak leaf combustion was 192 C.
As my table shows, fire moves much slower through oak litter than through short grass (little bluestem), although the flame heights are not much different. Some agency prescribed burners are required to present their BehavePlus calculations along with their burn plans. The control of woody invasive plants is one of the most important uses of fire in restoration ecology . It is important to understand that in most situations fire does not actually “kill” invasive shrubs. What it does is kill the cambium layer and associated xylem and phloem, thus preventing vertical transport between the stems and the roots. This effect is analogous to girdling. The roots, protected from the fire, are unharmed. In the root collar region of most hardwood trees and all shrubs are living dormant buds whose growth is suppressed by hormones coming from the stems. With the plant’s vertical transport system destroyed, the hormone supply to the roots is gone, so one or more of the dormant buds in the root collar is released. The above is a complicated way of saying that fire top-kills a shrub but does not get rid of it, because it will resprout from the base. 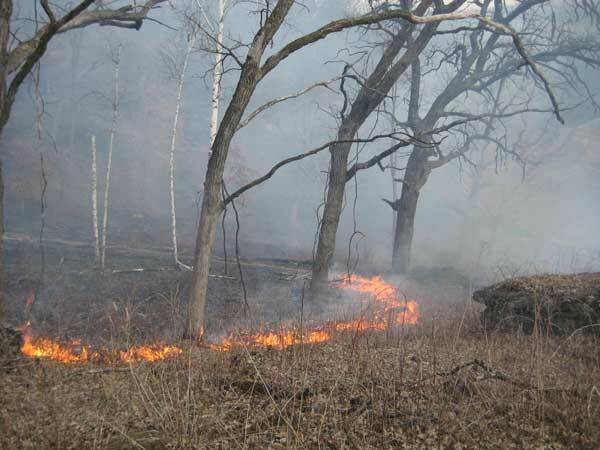 Thus, even a low-intensity savanna or oak woodland fire is hot enough to kill the stems of any shrub it passes near. The dormant buds in the root collar, now released from hormonal inhibition, grow. Thus, fire cannot eradicate well-established invasive shrubs. An understanding of how fire works offers a convincing case that herbicide use is essential to eradicate invasive shrubs. 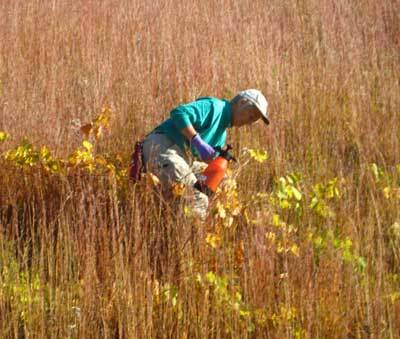 Fire and herbicide act as collaborative agents in the eradication of invasive woody plants. Although herbicide can be used without fire, it is much easier to kill shrubs after they have experienced fire. The small resprouts that arise from the top-killed shrubs are excellent targets for herbicide. A spring fire will set the stage for spraying. Spring is an ideal time to spray after burning because the native spring vegetation is small or still underground, and the shrub resprouts are also small and can easily be found. Fire should still be used even if herbicide use is not an option. If a site is burned annually, the shrubs will be top-killed annually and should never be able to become dominant again. However, in this situation, you can’t miss a year. There is, however, one situation in which fire by itself will actually eradicate woody plants. 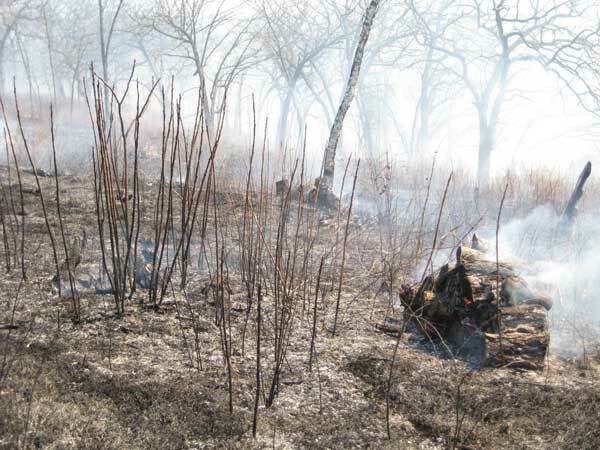 Newly grown shrub seedlings are killed by fire. This is because they have not had time to make a substantial root system, so dormant buds are not present. 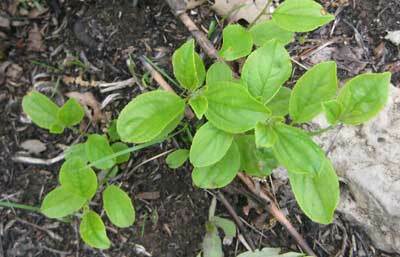 Thus, one might be able to eradicate a patch of buckthorn seedlings with fire (prescribed burn or a propane torch). However, in most restorations, the invasive shrubs are well past the seedling stage. There are 12 interesting videos scattered throughout the book, as well as lots of photos and drawings. The "Positive" in the title reflects the concept that restoration work provides people with the opportunity to do what they like to do, which is participate positively with nature. I was able to copy the book from the CD to iTunes on my desktop computer and then transfer it to my iPad2. Everything transferred except the videos, which I believe require Flash, and Apple does not allow Flash on their iOS devices. Otherwise it worked well on the iPad, making it easy to read, pan, or turn a page. There have been several recent textbooks on ecological restoration, but Mark's book is unique, providing a real practical approach to the subject. The angle at which the sun strikes the slope has a great influence on temperature and hence on how quickly the snow melts. 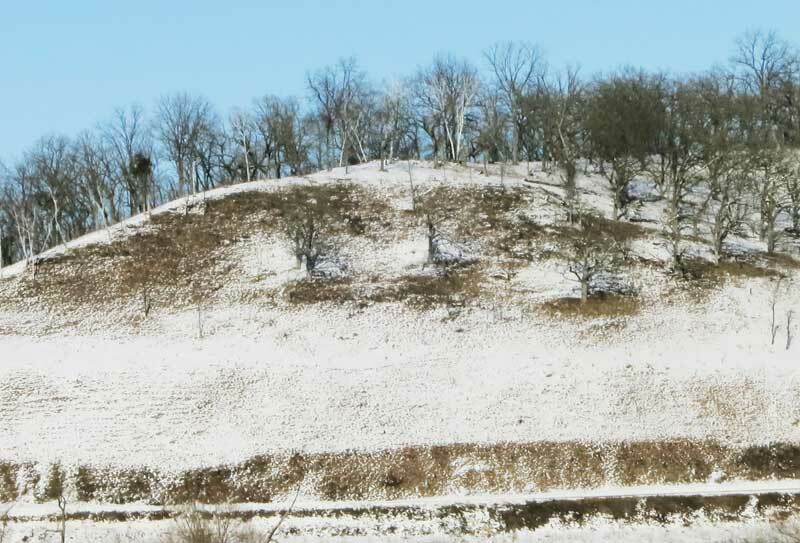 The lower snow-free area in the photo is the road cut just above Pleasant Valley Road. It is very steep and has its face directly into the sun. (I estimated its slope as about 78 degrees.) The area above the road cut is not so steep and hence the angle of the sun is less, so there less snow melt. Above that the topography gets steep again and most of the snow is gone. In this area there are also some effects due to the individual bur oaks. Finally, at the top, where the ground is almost level, the snow still remains quite deep. Of course, all year long the sun is affecting these different areas differently, which certainly leads to ecological consequences. 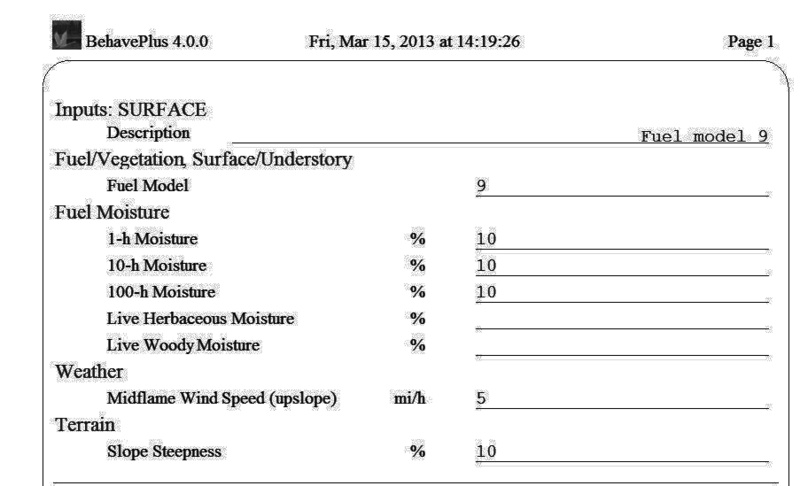 Soil moisture should be higher where the slope is less steep. It seems hard to believe that in a few weeks we will be burning!